Discover the new standard of gold with the ghd gold® styler. 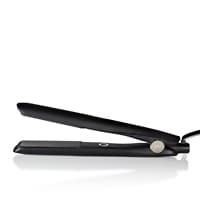 With new dual-zone technology, one sensor across the length of each plate, heats up the styler and maintains the optimum temperature of 185ºC meaning your styles will last all day. With it's glimmering and smooth contoured plates creating your style has never been so easy. The styler glides effortlessly through hair and makes for the perfect versatile styling tool creating stunning results. The new ghd gold® styler gives you a lust-worthy salon finish that outshines the rest giving you the real gold standard of styling.